The Twelfth (2002) Celebration – not Provocation. Glenwood Publications, First Floor, 316 Shankill Road, Belfast, BT13 3AB. THIS SUMMER I attended the Twelfth Parade in Belfast for the first time in over 15 years. It was just as I remembered it from my last visit. It remains a colourful, lively celebration of community. From the City Hall to the Field at Edenderry, the streets were lined with children, pensioners and all ages in between, enjoying the music, colour, pageantry and atmosphere. That night on the national news however, the only images shown were of the police clashing with republican youths attempting to attack Orangemen returning home through 'flashpoint' areas of North Belfast. The clear message broadcast around the world was Orange Parade = provocation = violence. The Twelfth is a welcome attempt to publicise the true meaning of the parades; the history behind them, the background to the politically motivated attacks on them and their wider cultural meaning to the Protestant community. In an increasingly bland world of commercialism and globalisation, the Twelfth should be something for Northern Ireland to celebrate; a genuinely non-commercial, non class, grassroots expression of popular culture.  The format of The Twelfth is a broad range of articles, written by the participants and spectators themselves. This year’s edition contains articles counterposing the significance of the Twelfth in rural Ulster with the views of a member of the more secular urban Protestant community. Observations from two German visitors to the Twelfth are included, and also an article on the controversy surrounding the Ballynafeigh Orangemen's attempts to march along the Ormeau Rd. Overall The Twelfth is an important tool to explain the Marching Season, both to those within our own community who are made to feel embarrassed by the whole thing and to the outside world who have only been allowed to see one side of the argument. It is all the more essential because we cannot rely on anyone else, be it the Tourist Board, the media or local councils to promote and explain the event, we have to do it ourselves. 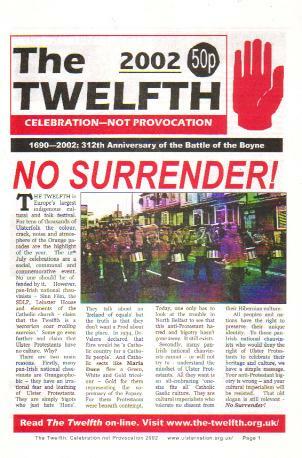 A PDF version of the 2002 edition of The Twelfth can be downloaded here or by clicking on the image above.